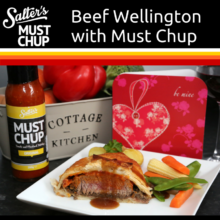 Our delicious Beef Wellington with Must-Chup Recipe. Perfect for a special night in! Season fillet of beef with salt and pepper and then place in pan and seal all sides. Remove from pan and immediately brush with Must Chup whilst still hot. Then place on a plate and let it sit and relax. Pour the duxcelle mixture into a dry frying pan so that it removes the water. Place the fillet of beef on top of the duxcelle and roll over the cling film around the beef. Roll it nice and tight into a cylindrical shape and squeeze and twist the ends. The tighter the better. Place in the fridge for 15 minutes to firm up. Once set take out of the fridge and remove the cling film. Roll out some more cling film onto a chopping board and place a layer of puff pastry onto the cling film already rolled out. Place the unwrapped cylinder of beef in the centre of the puff pastry and using the cling film roll the pastry round the beef until the end s meet. Trim off any pastry and twist the ends of the pastry until the beef is completely sealed. Roll the cling film round the pastry cylinder and squeeze until it is nice and tight. The more you twist the better the shape. The remove from oven and rest for 10 minutes so meat can rest and re absorb all the juices.